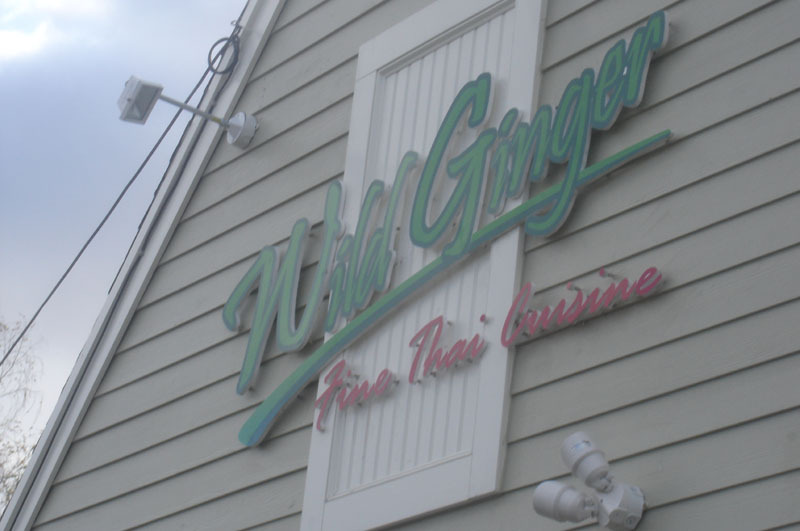 There is relatively new selection on the South Shore for Thai food– Wild Ginger on Route 53 in Norwell. This cozy restaurant is located in a small shopping plaza on the southbound side of 53. It is in the same space that used to house Cherrywood BBQ. We were there during lunch on a Saturday and were immediately seated. There were a few other parties in the bright and clean dining room. The servers were friendly and were quick to refill our water glasses (always a good thing in my book, since I am ALWAYS thirsty!). We started off with the Som Tum salad ($8). 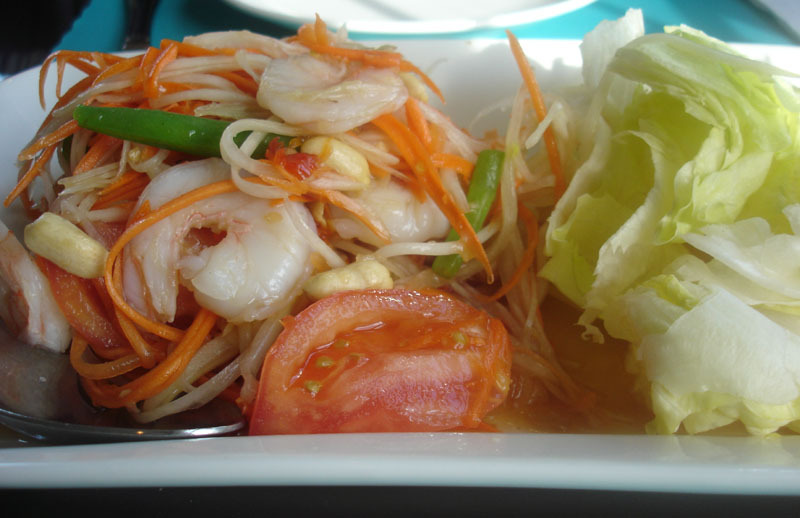 This salad was made up of shredded papaya and carrots tossed with shrimp, string beans, tomato wedges and peanuts. It was topped with a spicy lime dressing and had some iceberg lettuce on the side. The salad was refreshing and spicy. We couldn’t resist trying the veggie Thai Rolls ($5), which were spring rolls filled with assorted veggies and served with a sweet and sour dipping sauce. 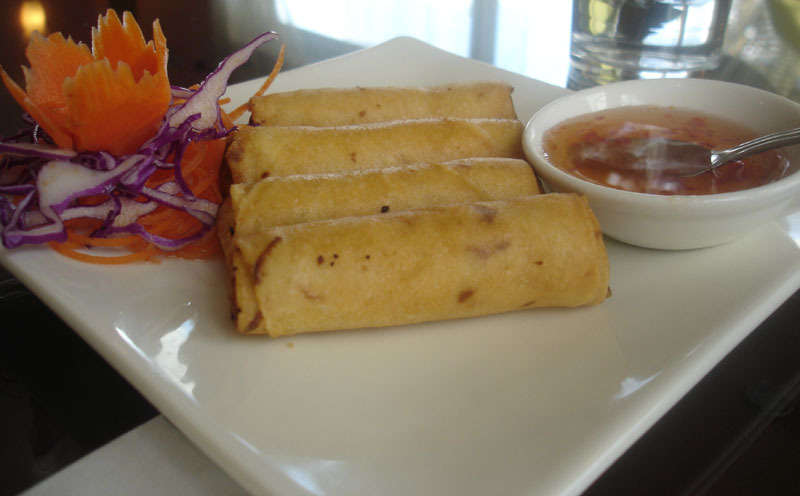 The spring rolls were crispy without being greasy. We got two entrees. The first was the Pik Pow Fried Rice ($9), a spicy seafood and veggie fried rice with pik pow sauce…all topped off with a sunnyside-up egg. The egg was a little overcooked. Based on my previous experience with Pik Pow rice at other Thai restaurants, the egg yolk should still be runny so that when you pop it, the yolk mixes in with the rice. 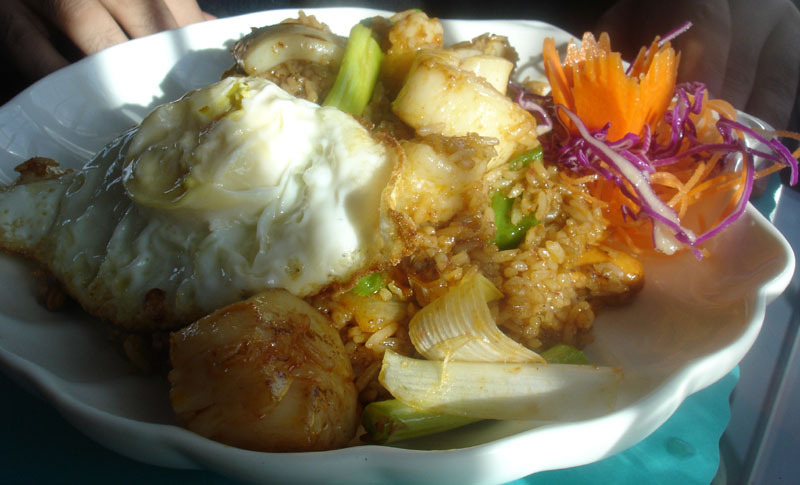 Despite the egg yolk being a bit too well down (more over-hard, than sunnyside up), the rice was very moist and flavorful and loaded with shrimp, scallops, and squid. The second entree that we got was the Chicken Hot Tangerine ($8). 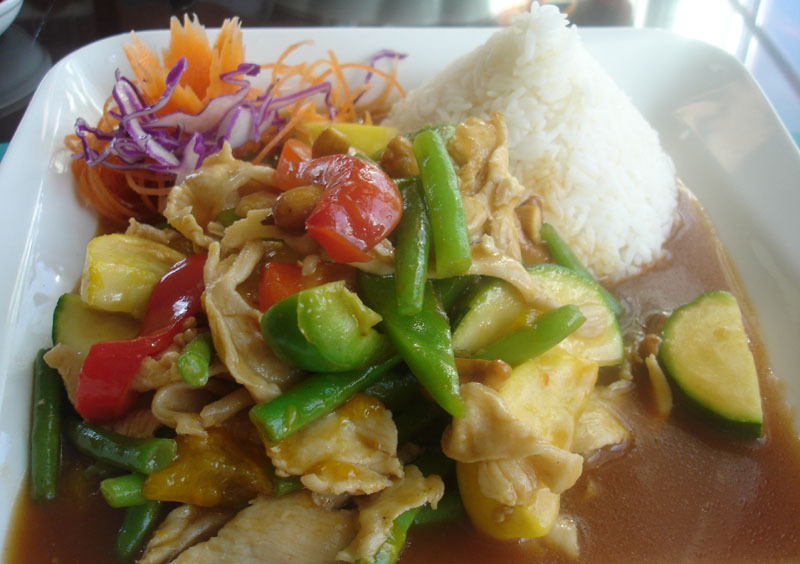 This dish featured sauteed chicken breast with veggies, tangerines, and cashews in a Thai chili sauce. The presentation was very colorful and the cone of rice made me think of an episode of Kitchen Nightmares where Gordon Ramsay berated a chef for using a funnel to shape a Greek Salad. The Chicken Hot Tangerine was spicy and sweet and quite tasty but not my favorite entree ever at a Thai restaurant. Overall, I was very impressed with Wild Ginger for their service and food. I will definitely be back for lunch again. I give them 4 out of 5 mangoes. 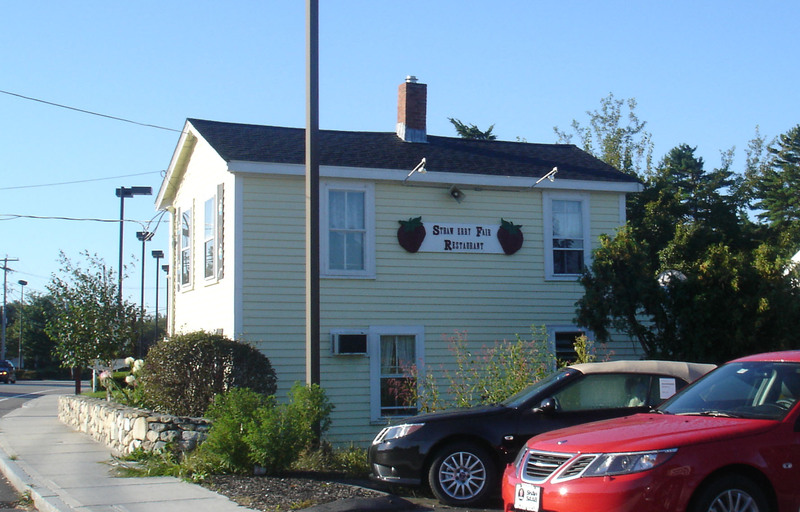 The Strawberry Fair is located near Queen Anne’s Corner in Norwell, just over the Hingham line. It’s in a renovated antique farmhouse that is currently tucked amongst car dealerships, a Chilis, and other not very antique places. 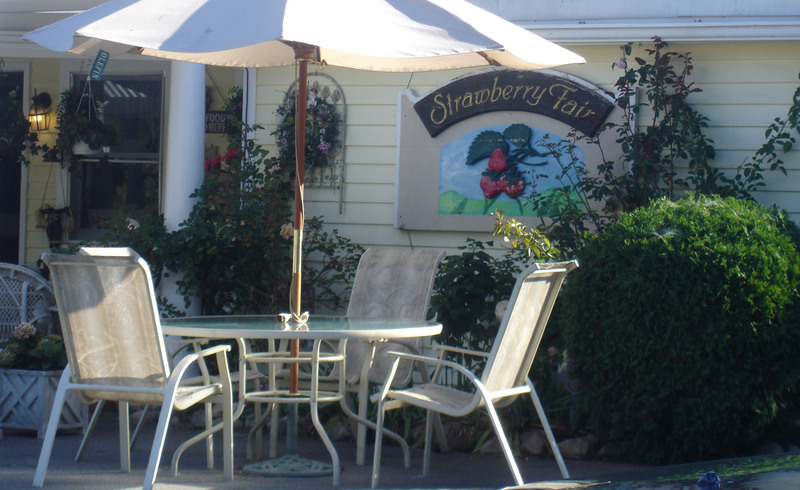 The interior decor is cottagey, quirky, cluttered-country, with most of the tables and chairs being different styles (some of the tables are actually antique sewing machines) and knick-knacks all over the place… most with a strawberry theme. Strawberry Fair serves up Saturday and Sunday brunch. 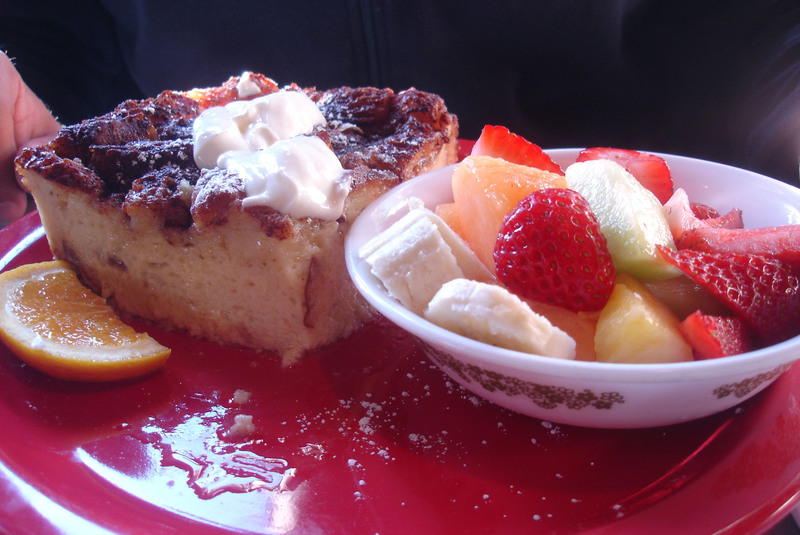 Their brunch menu has New England influences with dishes such as Corn Bread French Toast and the Brown-Eyed Susan (Eggs Benedict made with homemade brown bread). 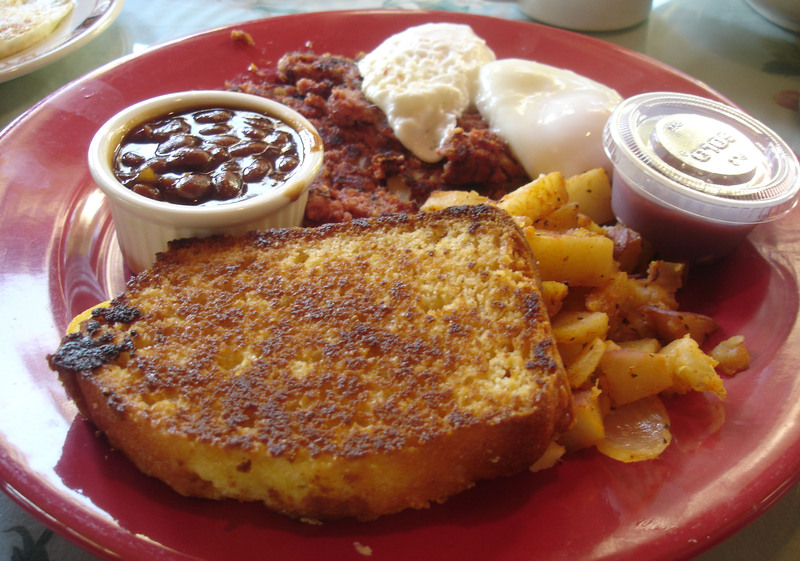 Many of the dishes are served with baked beans, toasted cornbread and strawberry jam. The food is pure comfort food and so good! I ordered the corned beef hash with poached eggs, hash browns, and toasted corn bread. This corned beef hash is NOT the stuff out of a can. I really appreciate a good corned beef hash and Strawberry Fair’s version gets my stamp of approval. It definitely gives me my corned beef fix. RATED: 4 out of 5 mangoes!